You’ve got to hand it to those Japanese: they really know how to entertain. Their game shows are awesome! 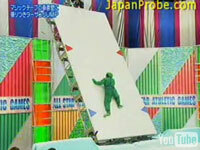 Just check out this video of contestants trying to scale a wall of velcro (or “magic tape”). Since they’re all wearing similar suits of velcro, their bodies react like sticky putty. The goal is to climb the giant wall, grab a rope, swing to another platform — and avoid falling into the pit of flour. Yeah, I don’t understand it either, but it’s still fun to watch. When are we going to see these type of shows in the US? Sign me up.